Exposed honeybee nest in a wall, using vacuum for extraction. Asbestos siding had to be removed in order to get to this nest. 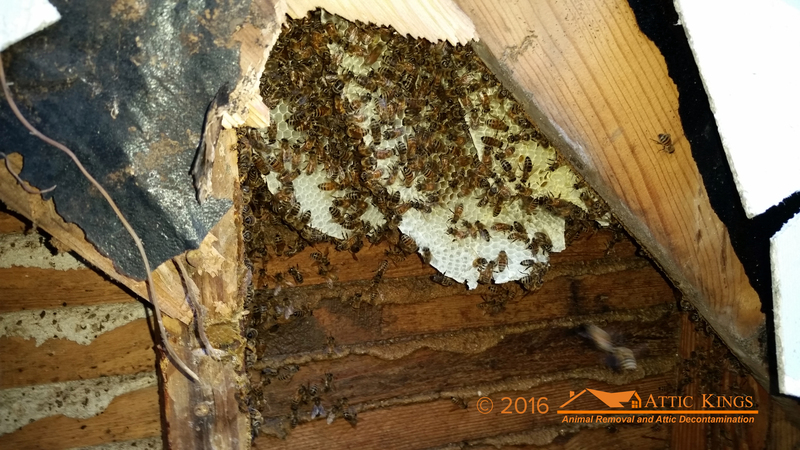 Beehives near or attached to the home can be a huge safety issue, especially to those who are allergic. If you have a bee or wasp hive around your home, call the Attic Kings. We’ll remove the hive and keep your family safe. We use ZERO chemicals when liberating your home or dwelling of bees. Bees typically build their hives in trees or underneath some structure for it to hang. Their hives have hexagon shaped combs made from wax. This is very different from a hornet’s nest which looks more like paper and is gray. Bees also do not travel inside their hive like hornets do. Removal of white faced hornet’s nest from a tree. When we remove a hive, we try our best not to harm the bees. Bees are pollinators and are very important to our ecosystem. 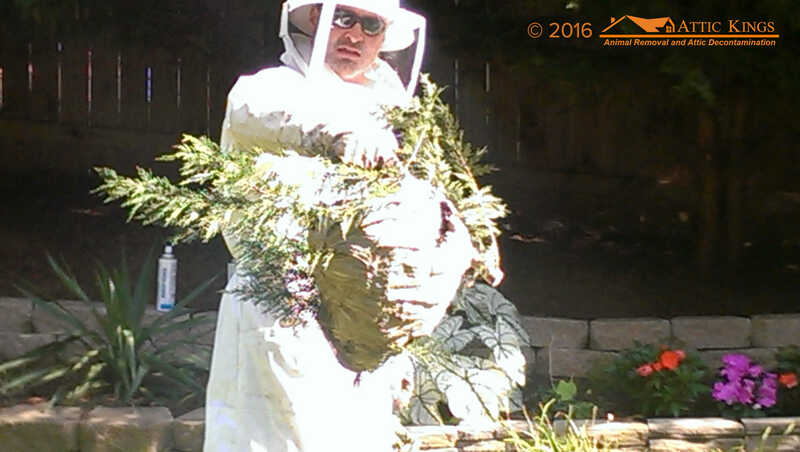 To remove the bees, we’ll come out in protective clothing and take the hive away from your home. We can use smoke to calm the bees and soapy water to slow them down. Then we can vacuum them up and relocate the hive away from your home. For ground bees and hornets, we may use a plastic tinting to suffocate them. After they are all dead, we can then safely remove the nest. We do not use chemicals that will harm the bees in any way.